Los Angeles has always been on the forefront of innovative cuisine. Living in a creative diverse city breeds inspiration and motivation, especially for chefs. 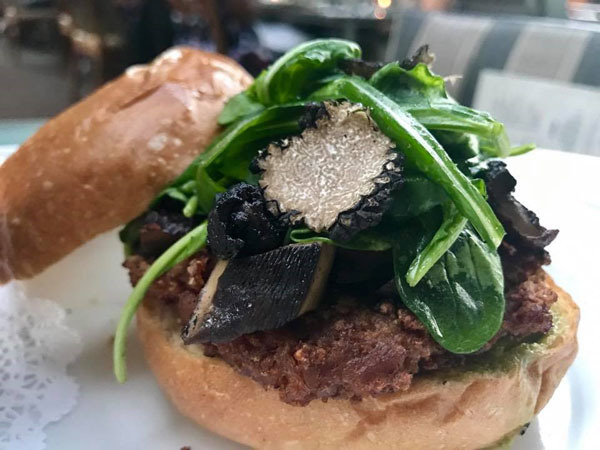 These food creators must continually surprise guests by upping the ante, whether that be with new flavor sensations, presentation, ethnic food fusing, or food ‘performance.’ In true SoCal style, vegan options are exploding on menus. Satiate your taste buds with one of these summer spots. Stay at the Marina del Rey Hotel and enjoy dinner and cocktails outside at Salt Restaurant and Bar with sweeping marina views and heat lamps to keep you warm at night. Salt brings a level of sophistication to the area. The personable Chef Mark Gold sat with us as we devoured hamachi and one of the best clam chowders we’ve ever tasted in LA with fresh massive clams. A whole lobster on a bed of Japanese udon noodles in a creamy brown butter sauce was a flavor twist first. This entree should be high on your ordering list. Expect the best locally sourced California-seasonal dishes and imaginative craft cocktails. Dinner items include Spanish seabass, handmade pork tortellini, line caught swordfish, and Mexican prawns in Bucatini pasta. Brunch is equally impressive with a myriad of options from a French style omelette, French toast, steel-cut oatmeal brûlée with toasted pumpkin seeds, and fresh berries, and Buenos Dias Chilaquiles with fresh tortilla chips, poached egg, chorizo, avocado, black beans, Hook’s cheddar, radish, red onion, and roasted tomatillo sauce. Looking to spend less? The happy hour menu is from 4:00 to 6:30. 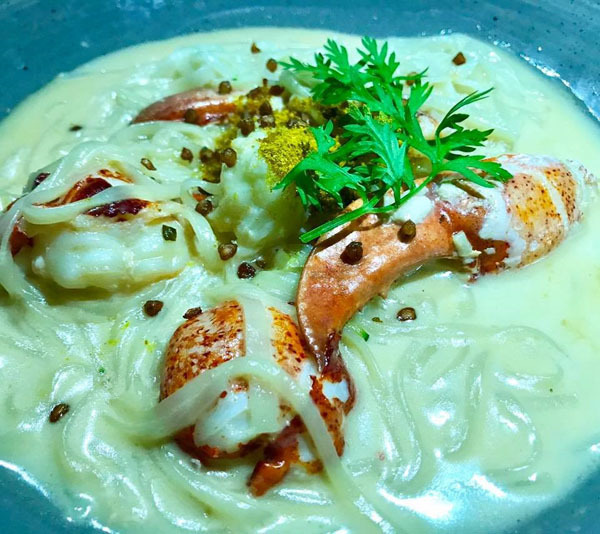 On the Sunset Strip in West Hollywood, find jolly and humble Brazilian Chef Diego Leporini crafting unique medleys and changing the menu often to keep your taste buds on alert. This casual rustic spot brings you culinary art in a 1930’s historic building, once the Screen Actor’s Guild headquarters. 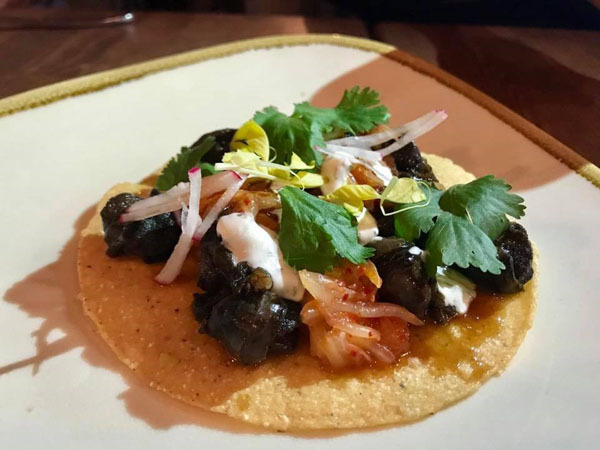 The chef takes escargot to another level served with kimchi and herb sour cream in a crispy tostada. Savor Los Angeles favorites, like burrata with peaches, and street style grilled corn with mayo, queso fresco, and cayenne. The summer menu features Duck and Waffles, Branzino, and Jidori Fried Chicken. This is the first place in LA we have seen sardines on the menu (reminiscent of my recent trip to Croatia) but these sardines were almost the size of a small plate, and came with dipping sauces like habanero and leek aioli. For those braver foodies, sample the lamb heart. End your night with fresh baked dark chocolate chip cookies and milk sorbet. Come for the wine and charcuterie bar too, or their $10 bottomless mimosa brunch. Surprisingly an opulent restaurant with such kitsch, show, and food performance still offers high quality delicious food. Entertain out of town guests or bring a small group for a special occasion. 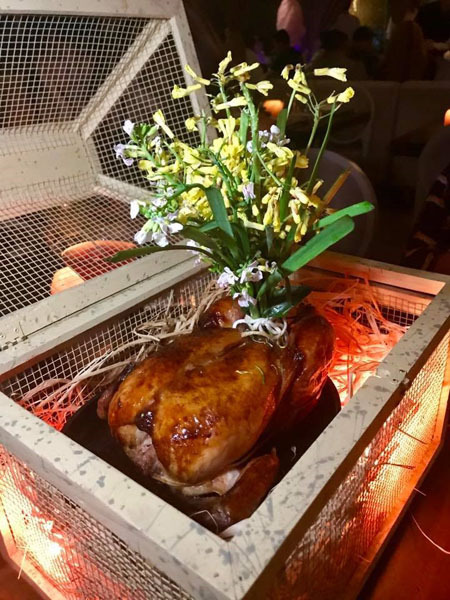 Barton G is guaranteed to WOW you all night long with their quirky menu, from a baked chicken presented in a glowing cage with cluck noises to a meatball almost the size of the disco ball next to it. Known for their lobster pop tarts and Marie Antoinette bust that comes with wispy several feet tall cotton candy hair for dessert, the entire night will keep you entertained. Other decadent items include the 50-oz KERWEE red-grade Australian Wagyu rib eye called the B.G. Platinum Ranch Tomahawk for Two with lime-broiled Maine lobster, blue prawns, charcoal yucca logs, charred tomato, and salsa ranchera. Bone marrow in a bone the size of a small table is perfect for greasing up your steak, while every entree comes out with what feels like a movie set. Giant sized forks are the perfect Instagram-worthy prop with your meal. Liquid Nitrogen is a key element in their tantalizing high-octane cocktails. Start with an edible shot with Havana club rum and honey that smokes in your mouth or one of their cotton candy smoking martinis. Chocolate monkeys, gin nitro-sticks and even boxing gloves or massive diamonds show up with your drinks. 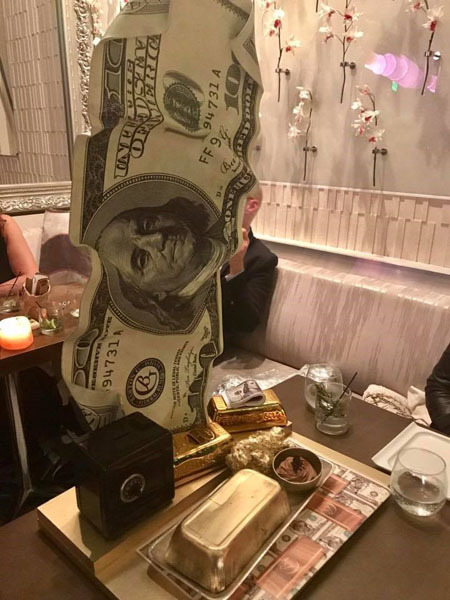 The life size dollar dessert rolls out with a golden bar skillfully blowtorched by our server to make S’mores! At least four people could share one dessert. Everything is presented over the top! The creativeness will push the boundaries of your imagination and your culinary expectations. 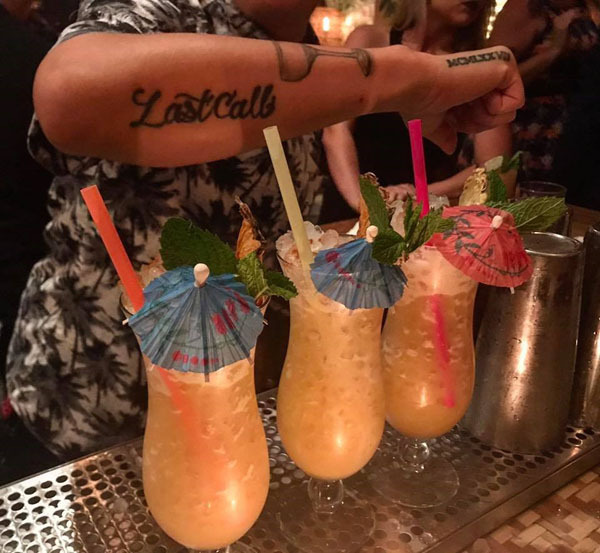 Escape the grit of the Sunset Strip and slide into this beautiful new tiki bar that has popped up complete with ornate palm frond design, a romantic glowing fountain, and a plethora of Pacific artifacts. Tropical Oceania inspired libations like the painkiller and coconut mojitos are deliciously strong and tasty. You will only need a few before you are dancing the night away with a cocktail umbrella stuck in your hair. For the 2 hour Lono dinner experience (not including alcohol), score one of their 5 tables for $100 per person with a 4 person minimum. Book ahead because this happens just three nights a week! Brought to you by the Umbrella Hospitality Group, the vibes of Lono resemble the old beachcomber days of Hollywood. The famed once celeb heavy restaurant on Sunset Boulevard below SoHo House West Hollywood now appeases vegans, salad eaters, and Los Angeles’s health conscious with a new menu consisting of Nidi Bolognese with mushrooms, Mediterranean Chickpea Panelle with smoked carrots and summer squash, Beet Poke, and a Wild Mushroom Burger. The Vegetable section includes options like Chipotle Lime Corn and Creamed Spinach with Crispy Shallots. Looking to branch out on your meat taste buds? Try their game meat selection like ostrich or bison with over 7 sauces. Organic chicken, Wagyu, filets, ribe eye, skirt steaks, and New York Strip are just some of the Turf choices to appease carnivores. Boa favorites can still be found on the menu, like Crab and Black Truffle Gnocchi and Lobster Mashed Potatoes. Who doesn’t want to be outside having a cocktail in summer? Better yet, poolside. 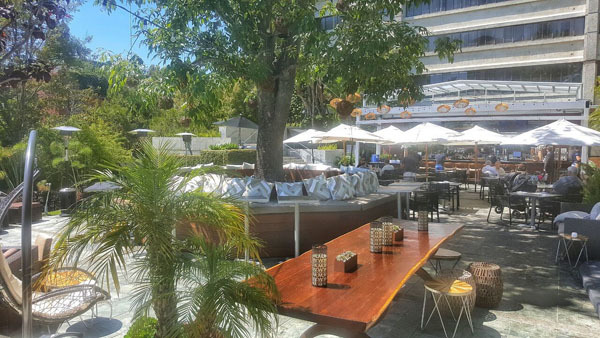 The Hideout is the expansion of STK Los Angeles, the modern steakhouse and chic lounge already inside, but now this poolside lounge, bar, and patio space will tantalize guests with menu items like Dijon Grilled Sonoma Lamb Loin and California White Seabass. Executive Chef Robert Liberato will feature shareable plates with the best California produce to help appease your appetite while you imbibe in their seasonal cocktails, made with fresh herbs and fresh pressed juices. Beverage Director Jason Shullo will bring classic cocktail twists, frozen concoctions, and a menu of mocktails. Frose, all day!